"A tasty and fairly simple way for people on a gluten-free or wheat-free diet to enjoy a noodle dish. I usually use 4 zucchini and 2 summer squash for a colorful mix." Cut zucchini into thin, noodle-like strips (a mandoline works well for this). Toss with the 2 teaspoons salt, and place in a colander to drain for 30 minutes. Bring a pot of water to boil. Add zucchini; cook for one minute. Drain; rinse immediately with cold water to stop cooking. Heat margarine in a large skillet over medium high heat. Add zucchini and garlic; cook and stir until just tender, about 5 minutes. Season to taste with salt and pepper. Sprinkle with Parmesan cheese. 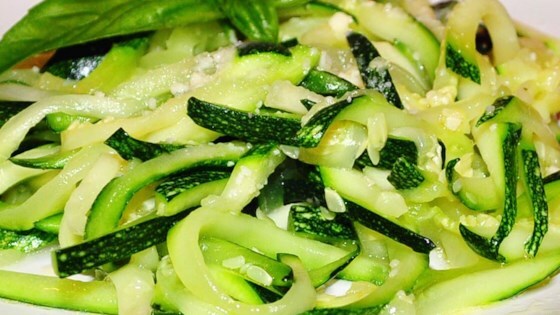 Zucchini turns into tasty “noodles” sautéed with garlic and topped with cheese. ok, but probably won't make again unless I have these ingredients on hand and need to use them up. This was a great alternative to eating my spagetti sauce with rice. The zucchini has great taste.